Businesses battled it out on the streets of Bury St Edmunds in a bid to be named the winners of a hospice’s new challenge event with a difference. 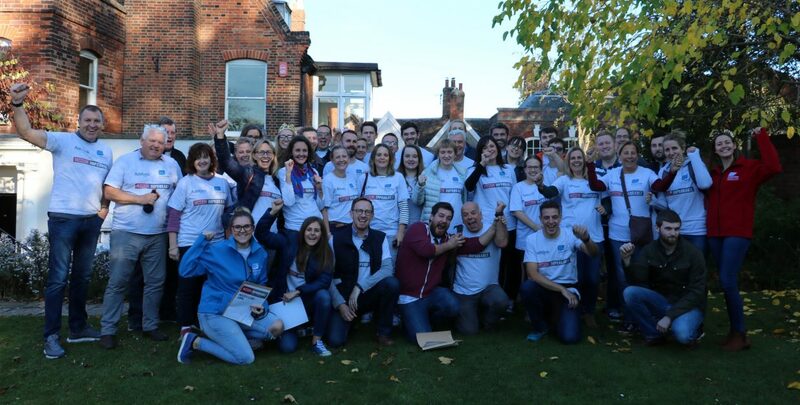 Sponsored by Ashtons Legal, St Nicholas Hospice Care’s first Mission: Improbable, saw 11 businesses put their teamwork to the test to raise £13,500 for the charity. With Greene King, Lark Technology, Martin & Co, RSM Accountants, Chassis Cab, the Farmers Club, Ashtons Legal, Menta, Hugh J Boswell, St Edmundsbury Financial Services and Gracewell of Kentford all throwing their hats into the ring, the stage was set for plenty of competitive fun. Armed with a mobile phone, the challenge, which took place last Friday (October 19), saw the teams navigate their way around the town to complete a series of unknown challenges. Ranging from taking a photograph by the Crown Street road sign wearing a crown, to running a mile on a treadmill and balancing a raw egg on their heads, teams had to use a variety of different skills as they battled it out for the top spot. After some fierce competition, electrical and control engineers, Lark Technology, proved their worth by collecting the most points and were crowned the champions. Lark Technology’s finance director, Jon Collard said: “The Mission Improbable event was a great opportunity to put our business minds and teamwork to the test at the same time as supporting a great cause. With businesses asked to fundraise a minimum of £1,000 for the charity, which supports those across west Suffolk, and Thetford, so far, some £13,500 has been raised, but that sum could increase as businesses return further sponsorship money. St Nicholas Hospice Care, corporate fundraising manager, Abby Mayes said: “Our first Mission: Improbable event was great fun. The teams took up the challenges with gusto as they raced against the clock to earn points.